Ogeechee Audubon Society is a member-supported, 501 (c) 3 non-profit chapter of the National Audubon Society. 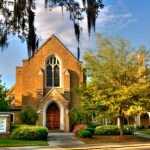 Our members generally live in Savannah, Georgia and the surrounding area. Ogeechee Audubon’s mission is to educate adults and children about birds, wildlife and the environment. We provide opportunities to enjoy the world around us, and advocate for responsible public policy and legislation for the conservation of our natural resources. Participating with Ogeechee Audubon offers an exciting way to learn and explore as well as meet new people or connect with old friends. We conduct several birding field trips each month to natural areas in and around Savannah. Each trip is led by an expert birder or naturalist who can help beginners to find and identify birds and other wildlife. They are an excellent resource for learning more about our natural environment..
We also host a wide range of speakers at our meetings who give talks on various topics relating to birds and natural sciences. These events are perfect for those looking to learn more about our environment and the creatures that it sustains. Both our field trips and meetings are open to the public. Information about member benefits and becoming a member can be found here. The current revised edition of the Ogeechee Audubon Society By-Laws is attached, approved by member vote on April 17, 2018.